How to make a new piece of furniture look old with paint and distressing…Kitchen hutch reveal…before and after! I wanted to share my hutch make-over with you and how you can also make a new piece of furniture look old with paint and distressing. It’s not hard to do if you have patience for layering paint! First, I sanded it so the wood had a bit of a “tooth” on it. Then I ran a candle on any edges I wanted to be able to sand down to bare wood. Then I painted a grey primer on the base. I stained, painted and distressed several times. I rubbed with a candle again any areas I wanted to sand down to primer. then I painted my first coat of BM antique jade.I repeated with sanding and a candle,and then did another layer of antique jade mixed with 25% white paint for a lighter color. I also distressed a bit with masking tape. Once I had the look I wanted, I went over the entire piece with minwax stain in American Oak. Once it dried, I went over the entire piece in Polyacrylic in Satin finish. You can also use dark wax, I prefer paint. Either one will darken the paint for the right effect. 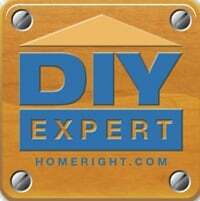 If you are trying to decide using wax or poly with paint, you can read this post here. And then painted the inside the wall color so my white dishes pop, and my grandmother’s collection of hobnail cake plates stood out. I added rust colored handles and pulls for a more rustic look. It holds so much more than the cabinets we had there, but takes up less space so our little, cozy kitchen actually seems a bit larger. It was such a good decision to pull them out. You can read about our entire kitchen remodel here. I am so glad I did it. I love it more than if I had bought a piece!!!! You can easily take an old piece and make it look old with some patience and paint! 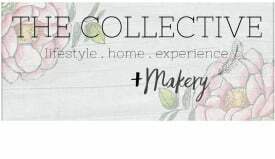 Make sure you stop by for my Etsy shop for items for some vintage and handmade items of your own! Oh Jennifer – it is stunning. It is so beautiful and made to be yours. One of a kind. What a gorgeous china cabinet. I absolutely love it. You did find the perfect color, I love the distressing too. Way to give your piece some awesome character! OH!!!! It looks fabulous Jen!! I love it. It does look old and antique now. The color, aging – everything is just perfect! Looks amazing! I would have never guessed it was the same cabinet as in the before pic. Love it! GET OUT OF HERE…you are the BEST at painting furniture!!! It is so amazing! I can’t wait for the big reveal!!! AMAZING transformation!!! You’d never know it wasn’t an antique. I’m so impressed… All that painting and extra lovin’ you gave it makes it an amazing piece. Congrats! I’m paying for your airfare, putting you up in our cute little 1910 Victorian, and you’re gonna re-do my fugly 1990-era Broyhill armoires. I’ll leave the light on, woot! The hutch is So Gorgeous! I can’t believe how it ended up so lovely. Well, how awesome is that? It looks fabulous~like it’s 150 years old. Love the color, too. It looks like a total different piece. A job well done. Also, congrats on your new shop. It is fabulous. This looks so much better than it did to begin with. Great job on the distressing, and the color really is perfect. oh my goodness. This is the most gorgeous piece!!! Jennifer, you did such a wonderful job….you will love this piece forever, I am sure!! It looks sooo good! Do you put a finishing product over the top at the end so it feels smooth? If so what? Or do you just leave it after the distressing? I would love to know. WOW!! I LOVE LOVE LOVE it!!! This is so beautiful!!! Great job! Jen- Another great thing about this is that it appears to be super sturdy and sometimes older ones are a little shaky….I think you did an awesome job! gorgeous!!! i love the color and the finish- just beaiutiful. you did a fabulous job! enjoy it! LOVE IT!! You did a great job!!!! I have a cabinet that I would love for you to do that to…. You did a great job! Looks good with all the dishes in it! Hi Jennifer, What a wonderful transformation! I love the color and the distressing. 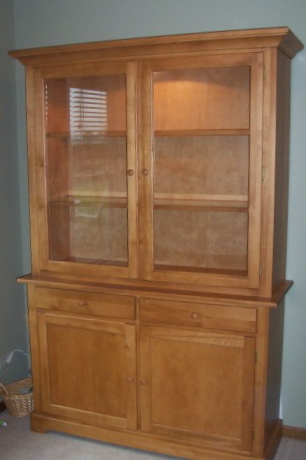 Who needs an antique when you can transform a new hutch into this beautiful piece? If I say “freakin'” is that too naughty? Because this is freakin’ amazing! LOVE IT! oh my gosh jen, it is gorgeous. doesn’t even look like the same cabinet. it’s perfect. Wow ~ what an amazing job you did!! I had to go back & forth between the pictures because it doesn’t even look like the same cabinet! Seriously wow!!! holy smokes i LOVE IT!!! seriously stunning!!!! You must be so in love with it! Stunning! Gorgeous! Oh how I need one like this. Your distressing is great and it looks like an antique now. I love what you did- it has sooooo much more character now. Oh wow, I just love it! WOWZER! That is fantastic. Love the hardware too, great choice. Hello Jennifer!! This is Triveni. I am a young development professional from India and I have been following your blog since the past two years. I am not quite sure how I stumbled upon your blog but I just wanted you to know how wonderful it is. In fact its one of the first things I read when I am at work. I am amazed at the variety of your accomplishments and you are always a source of great inspiration for me. All the very best with your new venture. Jennifer that hutch is amazing! I love all the different tones and the wood peaking through! I love it! Ummm…hello…that’s amazing! You did such a great job on the hutch…the colors amazing…the handles and pulls are amazing…the…well you get the idea…it’s amazing. I LOVE it! You did a magnificent job. I love the color…great choice! I oh so wish I knew how to distress like that. Just found you from UrbanFarmGirl…. Beautiful! I love the final color, great job getting the right mix! OH MY GOODNESS!!!!! One of my most favorite pieces I have EVER seen. I want it! It is GORGEOUS! You are so talented! Oh wow, I love it! Super. Your Grandmother would be SO PROUD. Your hutch is beautiful. Love the way you painted and distressed it. Woman, you are SO GOOD!!! You blow my mind. I LOVE this! I want to do something similar to my hutch in the dining area but I have been stalled out because I’m not sure where to start. I know you have tons of tutorials here, but I don’t know which one is the most applicable to this type of project? Are you going to share your step-by-steps on this one? gorgeous, gorgeous, gorgeous…i don’t even know what else to say. It is so whimsical looking! Awesome color! I love it! I am going to feature this on my blog today! Wow Jen! It is simply stunning. The color is perfect. I love it. I can’t wait to see the whole kitchen!!! I’m having a giveaway…I hope you’ll stop by!! What a beautiful piece. Nice work! WOW! that’s all I can think of – it’s just so darn pretty now and the color is amamzing! So beautiful!! Looks like an antique. You did a wonderful job!! OH mY!!!!!!!! What a BEAUTYYYYY!!!!! What I would do to have a kitchen hutch to look just like this one! You did such a great job!!!!!! I just LOVE it…. Absolutely lovely. It’s such a beautiful color and so perfectly distressed. I love it! It is beautiful! I am amazed at how you transformed it from new to old with character. Just lovely. It has so much character! I love it! It’s beautiful! Where did you buy the hardware? I’m looking for similar pulls for our kitchen. Wow I will have to admit I did not think I would love it as much as I do!! I did not like the before but wow you made it perfect!!!! uh-MA-ZING! the color, the perfect distressing…LOVE LOVE LOVE it! When I saw this hutch in your kitchen photos, I thought it was an antique! You did a fabulous job painting and distressing it. It looked so plain and boring before and you turned it into the star of the room!